In this article, linkblogs are referred to as a “cancer”. A link post is described as “simple curation… generally featuring a blockquote from an interesting part of a piece, and then linking directly back to the source.” They are cancerous because they don’t carry the depth of regular weblog posts, but supplant the latter too often on too many sites. The author states they were pioneered by John Gruber of Daring Fireball. So here’s what happened – I read that months ago, saw a couple other misunderstandings about the history of linkblogs (or linklogs), and thought I should write it up. I was blogging through that whole era, and I know what happened. But I decided to find sources for all of my vague remembrances, and that took a while, and then I got interested in drawing lines between early weblogs and current services like Tumblr and Twitter, and now it’s months later and here we are. A cursory yet mostly accurate trip down one leg of blogging’s dessicated spider-corpse! 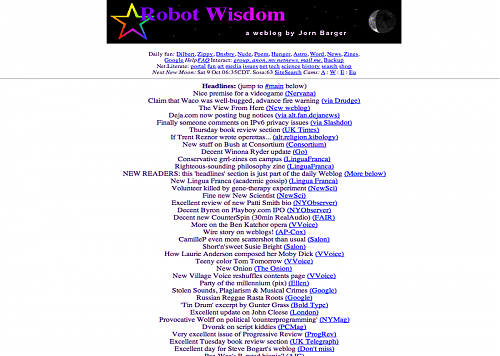 The original weblogs were link-driven sites. Each was a mixture in unique proportions of links, commentary, and personal thoughts and essays. Weblogs could only be created by people who already knew how to make a website. A weblog editor had either taught herself to code HTML for fun, or, after working all day creating commercial websites, spent several off-work hours every day surfing the web and posting to her site. These were web enthusiasts. Many current weblogs follow this original style. Their editors present links both to little-known corners of the web and to current news articles they feel are worthy of note. Such links are nearly always accompanied by the editor’s commentary… More skillful editors manage to convey all of these things in the sentence or two with which they introduce the link… Indeed, the format of the typical weblog, providing only a very short space in which to write an entry, encourages pithiness on the part of the writer; longer commentary is often given its own space as a separate essay. Robot Wisdom circa 1999. All link posts. 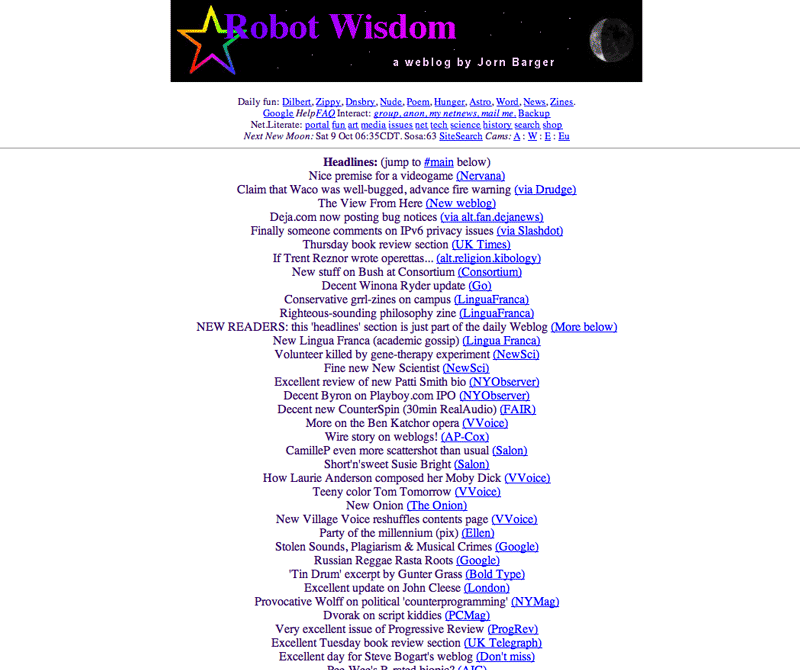 So the first weblogs (such as Robot Wisdom) are exclusively link blogs, as the first bloggers were all web people and links were their currency. This changed, presumably because of the growth of user-friendly blog posting software such as Blogger) and Movable Type, which allowed non-web people to maintain weblogs – people who wanted to share things other than links. Indeed, the limitations and biases of publishing software are a big reason why the medium evolved in certain ways. Blogger came out in 1999. 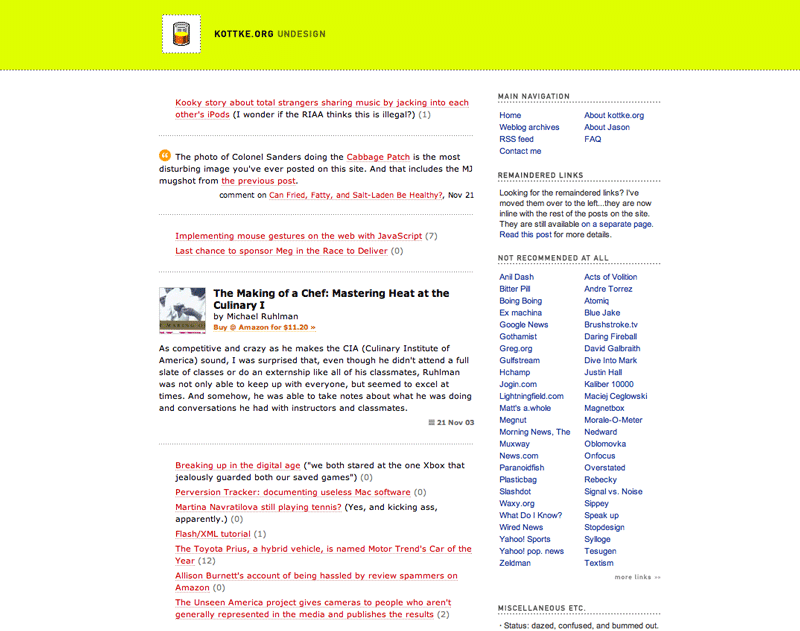 The first Blogger interface did not have a title field, making it more suited to linklogs and shorter-form content. But they added a title field, and Movable Type (2001) had one by default, also categories, then tags, and more and more cruft and metadata. I seem to recall that in the blogging community there was a bit of fatigue with the old-style, link list weblogs, as they were the past – stale ground in a very fast-moving world. People were into exploring the new things that tech like Movable Type made possible: longer personal essay posts, yes, but also photoblogs, videoblogs, et cetera. 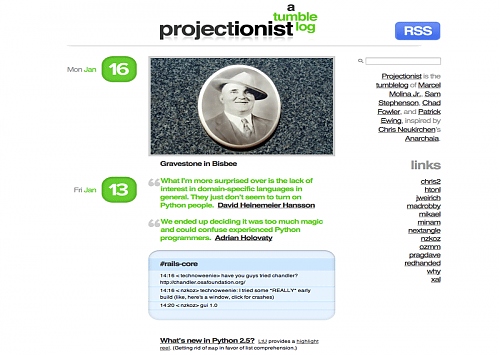 Many people maintained link logs still, but they became a side blog that was put in one’s sidebar along with the “blogroll” that listed one’s friends, idols, or reciprocal linkers. 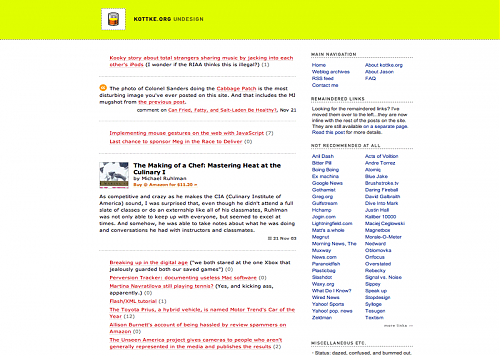 Consider kottke.org in 2003 and the “remaindered links” section. This was often done on the backend as a separate weblog since the blogging software made it near-impossible to do it otherwise. 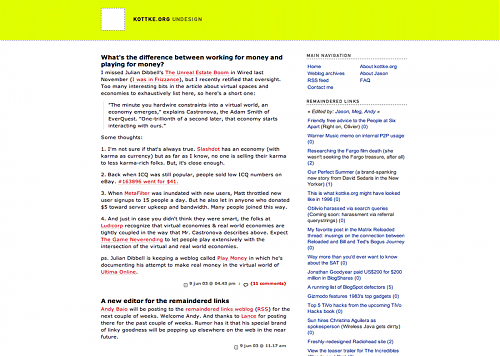 Kottke in 2003, with remaindered links to the side. 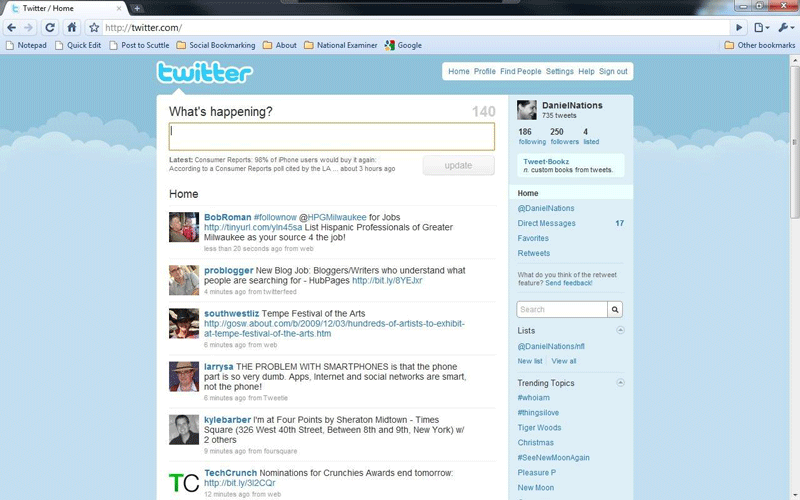 Delicious came out in 2003, and became the backend tech for a hell of a lot of sideblogs, as well as the precursor to a lot of web 2.0 technology to come that would gradually take over the function of weblogs by making things easy and adding social features: Flickr, Twitter, Facebook, etc. John Gruber’s Daring Fireball debuted in 2002. The “linked list”, his version of the linklog, did not appear until 2004. It was a separate page and an RSS feed intended as a perk for his paid subscribers. 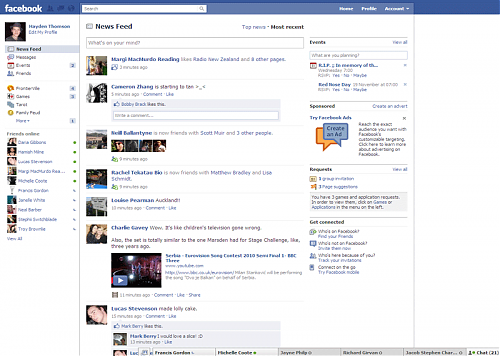 At some point in 2005, it shifted to the main column of the site along with the regular posts. 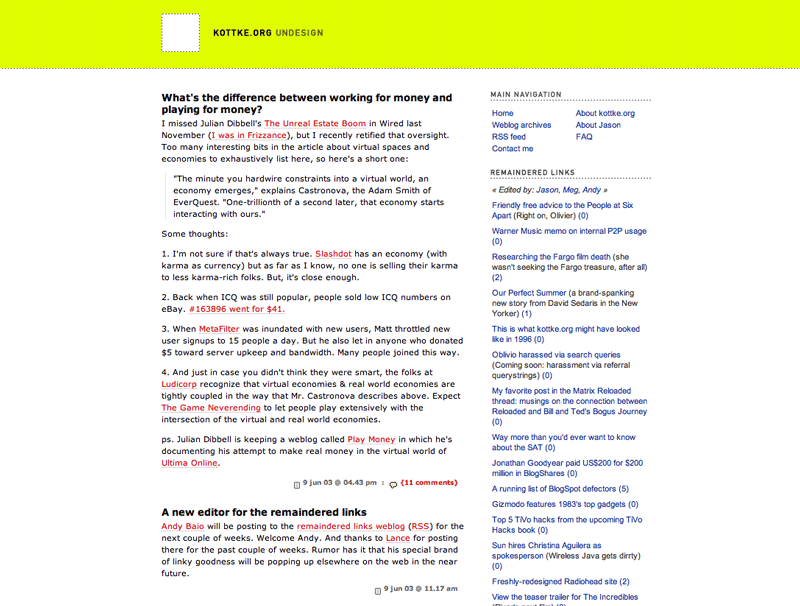 In a huge development, here’s Kottke.org in november 2003, featuring “remaindered links” inline with regular blog posts and several other categories. By default, most current weblog software, including the package I use, doesn’t allow for different data for different post types displayed with different designs in the same list. Typically what people have done with their disparate data is to display them on separate pages or in separate locations on their site…so you need to visit the book page to see if there are any new book reviews or scroll down to check if they’ve added a new album to their “now playing” section. To me, that seems not so optimal. A post is a post is a post. The newest content should appear at the top of the list of posts regardless of whether it’s a short movie review, one-line link, latest photo, or any other type of update to your site that doesn’t fit the typical title/text/category weblog paradigm and each type of content should displayed appropriately. What I’ve actually done is created 5 separate weblogs with MT and, using a bunch of MT plugins (MTSQL,Compare, MTAmazon, ExtraFields, etc. ), have aggregated the 5 weblogs on the front page of the site. Which sounds complicated (and is!). But only in implementation (due to the limitations of the software). Really it’s just the appropriate data presented with the appropriate design(s) in the appropriate context(s). One site, lots of content, many ways to view it. 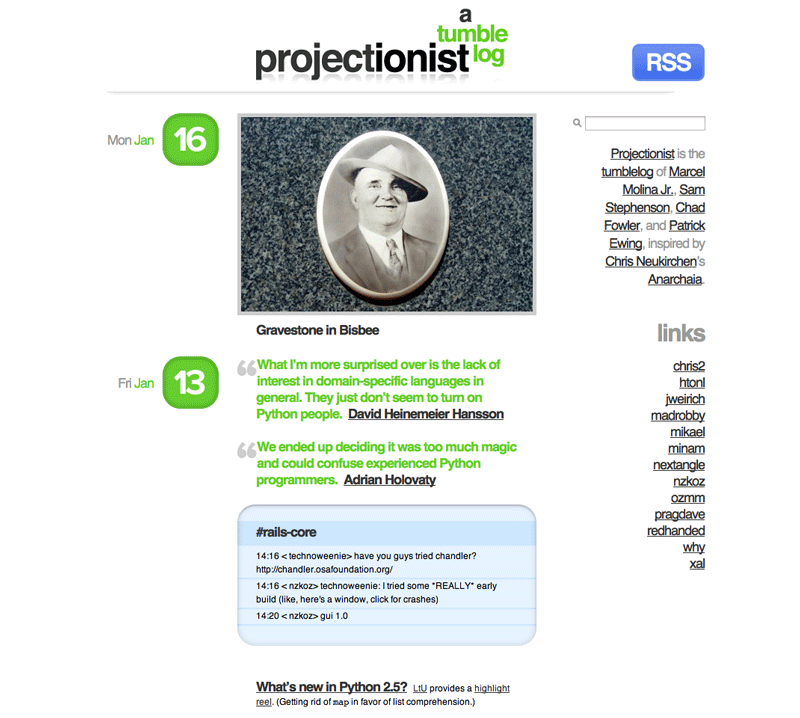 The observant reader will… observe that such a technical mess could be avoided by using Tumblr. Tumblr was a blogging platform based on a mutant category of blog called a tumblelog. It was almost exactly what Kottke was describing: a unified flow of posts of different types, with each type distinguished by a different design. The term was coined (by why of Ruby fame) in 2005, and Tumblr itself was launched in early 2007. Tumblr now has over 150 million users. Some consider link blogging a type of “microblogging”, and the boss of that world is Twitter, which launched in 2006 and now has 500 million users. It’s not the same thing as a linklog, but it is indeed a service used by many to exchange links, and is displayed in much the same way. Facebook, with its billion users, presents mixed links, posts, photos and other types of data units in a mixed stream, just as kottke started in 2003. That’s pretty much the evolution as I can trace it. If there were other sites that beat Kottke to the mixed-design unified stream format, the ur-tumblelog, I’d love to know of it, so let me know and I will update this post.